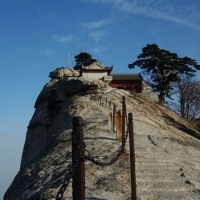 Mountain Huashan or Mt. Hua Shan is located in the eastern part of Shaanxi Province, about 120 kilometers from Xian, belonging to the eastern section of Mount Qinling. Seen from a distance, its five peaks look like a flower, hence the name (flower is pronounced hua in Chinese). It is also called Mount Taihua, known in the ancient times as the Western Mountain in Shaanxi Province at an elevation of 2, 160 meters. This mountain is one of the Chinese Five Sacred Mountains (i.e. the Eastern Mountain in Shandong Province, the Southern Mountain in Hunan, the Western Mountain in Shaanxi Province, the Northern Mountain in Shanxi Province, and the Central Mountain in Henan Province). 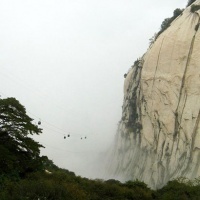 Mountain Huashan is known as the most precipitous mountain in the planet. It is famed for its natural vistas of steep and narrow paths, precipitous crags, and a breathtaking mountain range. There is a proverb goes that in China: "From time immemorial the Mt. 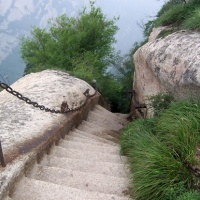 Huashan has been only one way to climb atop." so you can imagine its steepness. 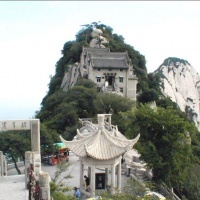 The mountain is the holy land of Taoism, some famous Taoist temples perched on the mountain. In ancient times the emperors of different dynasties made pilgrimages here. The famous spots in the Mt. Huashan include the Jade Spring Temple (Yuquan Yuan), Cloud Terrace Peak (North Peak), Gold Lock Pass (Jinsuo Guan), Jade Maiden Peak (Middle Peak or Yunu Peak), Facing Sun Peak (East Peak), Landing Wild Geese Peak (South Peak), and Lotus Flower Peak (The West Peak) etc. There are ropeways to reach some of the peaks in the mountain. 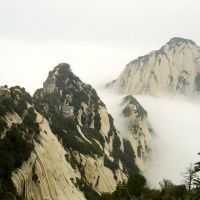 Mountain Huashan is one of the key national scenic spots in China. Flight of Fancy - A 3.1-hectare heliport has been built at the foot of Mount Huashan, a renowned tourist destination in Shaanxi Province. Mt. 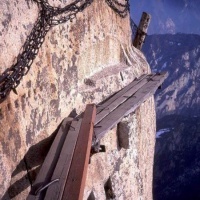 Huashan is one of China's five most famous scenic mountains, known for its steep and dangerous peaks. The new helipad is a strategic move by the provincial government to accelerate the development of local tourism. In these years, it has become the Rock-climbers' Mecca for its excellent climbing conditions. In Septembers, the Mt. Huashan China International Rock-Climbing is held here. Many climbing enthusiasts from all over the world will flock here to show their skills. The optimum time to the Mountain Huashan is from April to October. Different wonders can be viewed in different seasons in the mountain. The peaks, sea of clouds, mist, sunrise, sunset, and winter snow...you can feast your eyes on these stunning prospects under different weather conditions. Hello Half, don't worry about the safety, our travel consultant will send you some helpful hints. Is it safe? Any accidents ? Can we do it with kids ages 12-16?